So, I've joked about it, but boyfriend is seriously concerned about my new found DIY coaster obsession. I haven't even told you about the set we made together at a pottery painting studio, ha! But this particular coaster DIY... This project has been on my mind for quite some time... I was just trying to work out how to make it happen. 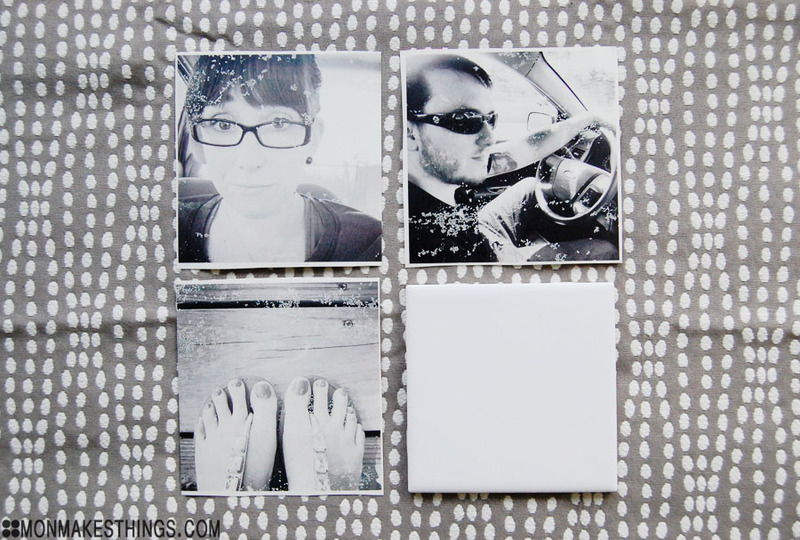 I've seen countless photo coaster projects where you simply mod podge photos onto tiles, but I wanted to transfer the photos. Like this canvas transfer I've been obsessed with for forever. And when the brilliant and beautiful ladies at ABM posted this transfer tutorial, I was over the moon. I essentially did the exact same thing, but with tiles instead of wood. So. Friggin. Cool. I love this technique. You are essentially printing your photo on a thin sheet of glue and transferring the glue to your hard surface. I love how imperfect the transfer turns out, giving the photos this really genuinely aged and distressed look. So here we go! Follow the tutorial at ABM. Basically, remove the actual labels from your label sheets and lightly spray the front of the label backing with your acrylic spray. Allow the spray to dry and apply a thin (but complete) coat of Elmer's glue to the sheet with a small sponge. 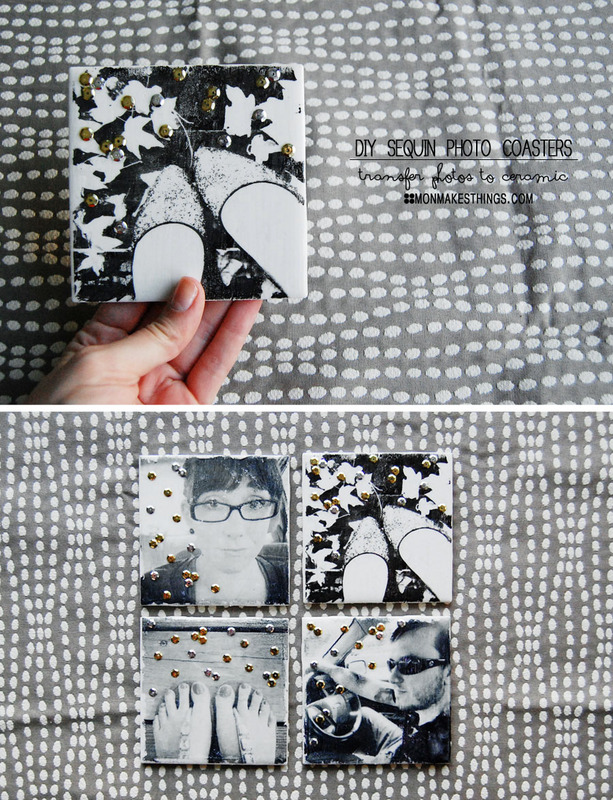 Allow the glue to dry fully and print your photos (over the glue) to whatever size you need. 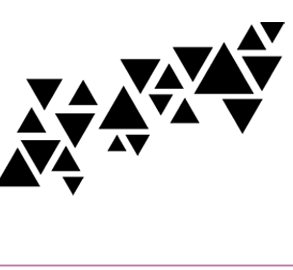 Remember that your photos will transfer backwards, so reverse them before printing if you'd like. Let the ink dry and cut your out your photos. They will print imperfectly because of the glue (see photo below). When the ink is dry, apply a thin coat of gel medium to your tile with one of your sponges. 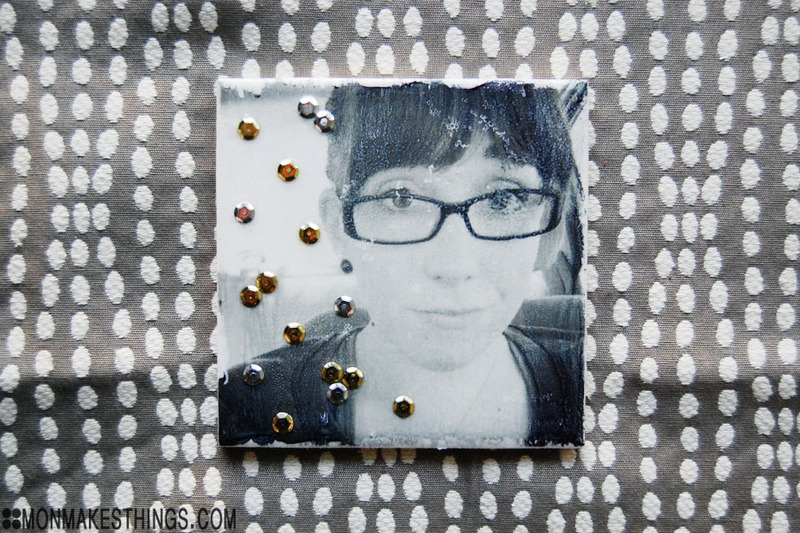 Flip your photo onto the gel medium while it is still wet and press the photo firmly onto the tile. Smooth out the paper with your fingers or a credit card, pushing any air bubbles to the edges. Allow the gel medium to dry for at least an hour, and carefully peel away your paper, leaving the image behind! Spray a thin coat of acrylic spray over your tile to seal the image. 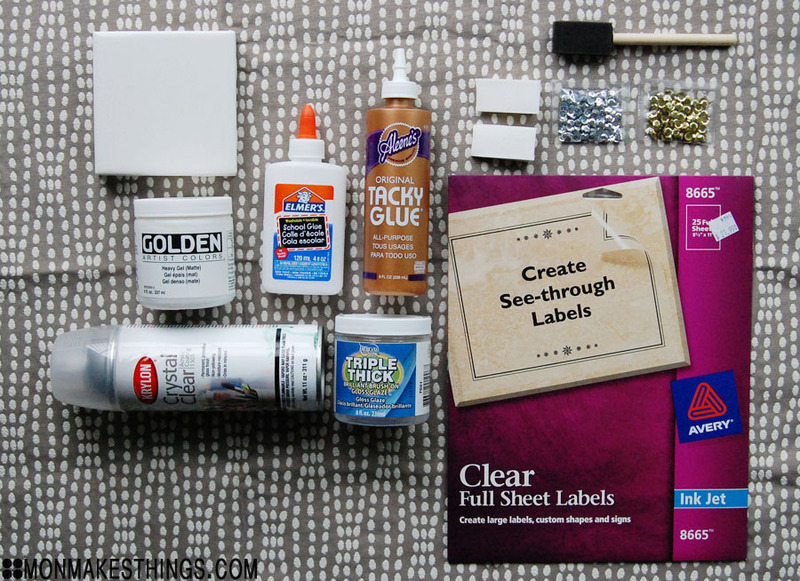 Once the spray has dried, arrange sequins on your tiles and secure using tacky glue. I stuck with gold and silver sequins for a neutral metallic look. Once the glue has dried, apply one or two coats of triple thick glaze using your foam brush. Let dry and that's it! I now have coasters with my own face and feet on them. Narcissistic much, Mon? Haha, if I had pets, I'd feature them on my coasters, honest. Keep in mind that details get lost in the transfer, so choose your photos accordingly. Like my other coaster projects, I think these would make really special gifts. I love the pop of shine the sequins give them... And seriously, those edges look like an Instagram border, BUT THEY'RE LEGIT! ;) Love it. I haven't backed these with anything yet, but you could back them with cork (like I did here), felt, or little sticky back guys I always see clever crafters using. Scott is trying to convince me to use these as wall decor rather than coasters (because we have several sets already!) What do you think? 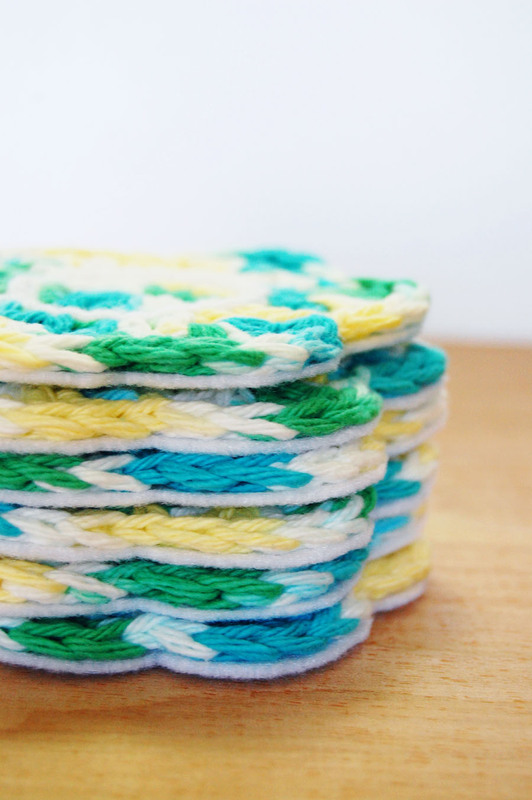 Are these coasters something you would use in your home? SOOO, I moved into my new apartment! And I love it. It has a beautiful layout with boatloads of natural light and a fantastic amount of space. I am smitten. I've even unpacked most of the boxes (cray!). I've got some crafty ideas for you cats coming up, as soon as I organize my new CRAFT SPACE (what!) But here is a project I did weekssss ago for ThinkCrafts! 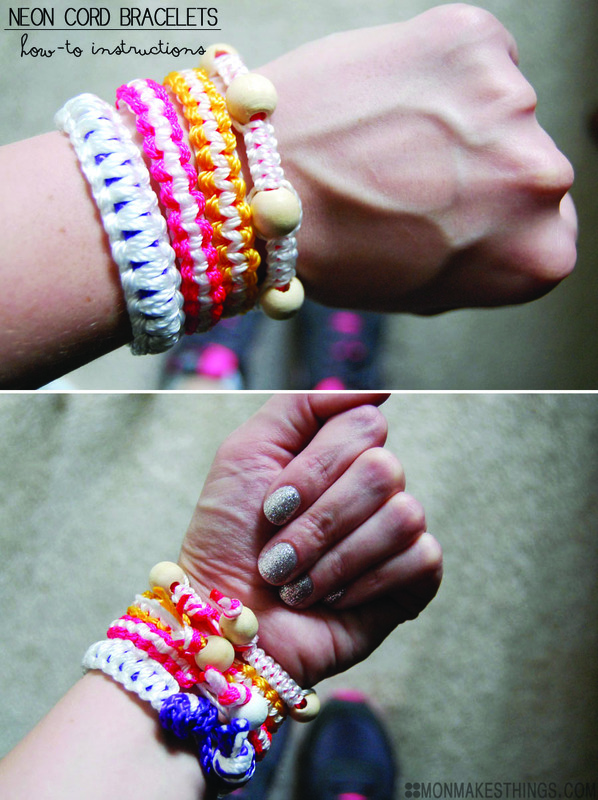 I whipped up some quick and easy bracelets out of leftover neon cord from my planter cover project. They're reminiscent of hemp bracelets, which I was totally obsessed with as a crafty tween. Anybody else? 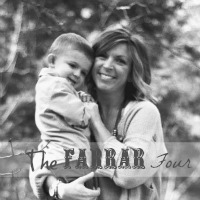 Anyway, I made a few different variations... Head on over and check out my post! Leave some love from Mon Makes Things while you're there. 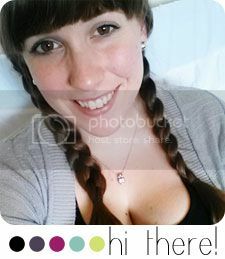 ;) I check the comments on the reg, hahaha. What's new in the lives of my favorite bloggy readers? 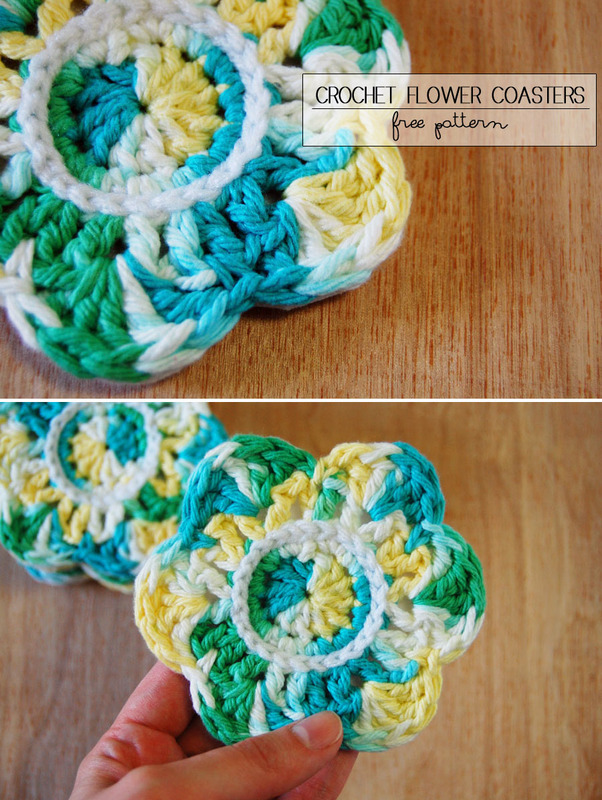 A few weeks ago, I whipped up some crochet flower coasters for ThinkCrafts. I've seen coasters like this all over, and was eager to come up with my own pattern. Check it out here and make your own! There's also information on how to back them with felt for added durability and a finished touch. I hope July is treating you all well so far!